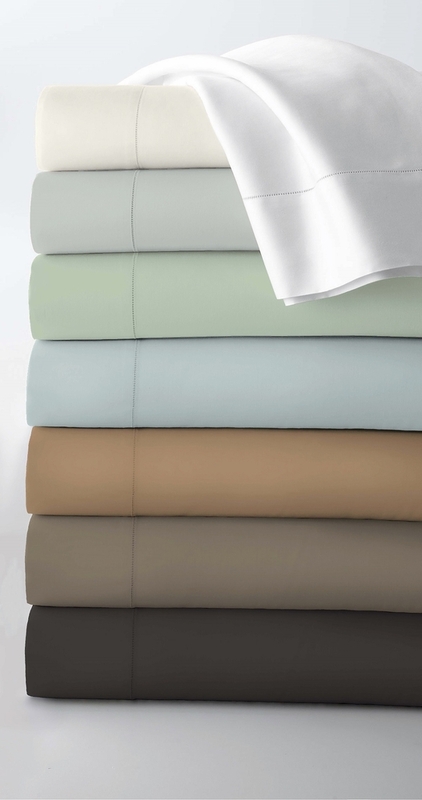 Rest in heavenly comfort on these elegant 800 Thread Count extra deep pocket sheets. Woven of 100% Egyptian cotton for extraordinarily soft, smooth and durable bedding. Sateen weave which gives soft, lustrous and smooth feel to the touch. Single-Ply yarn which enhances overall strength, and softness. Flat sheets and pillowcases have a single hemstitch treatment. Oversized flat sheets and extra deep pocket sheets that fit up to 24" deep mattresses and are elasticized all the way round to provide a snug fit. Available in Queen, King and Cal. King sizes. Queen sheet set includes fitted sheet, flat sheet and two standard pillowcases. King and California King sheet sets include fitted sheet, flat sheet and two king-size pillowcases. Machine wash. Imported. > 800 Thread Count Extra Deep Pocket Sheet Set. > Woven of 100% Egyptian Cotton for extraordinarily soft, smooth and durable bedding. > Sateen weave which gives soft, lustrous and smooth feel to the touch. > Flat sheets and pillowcases have a single hemstitch treatment. > 24" Deep Fitted Sheets. > Fitted sheets are extra deep pocket to fit mattresses up to 24 inch deep and are elasticized all the way round to give a snug fit. > Available in Queen, King and Cal. King sizes. > Blue, Ivory, White, Cafe, Green colors.